Recent research shows that queer youth increasingly reject traditional sexual labels in favour of more fluid identifications. Despite well-rehearsed debates around queer identity politics under neoliberalism, there is a dearth of research examining how queerness is understood and expressed in rural Australia. 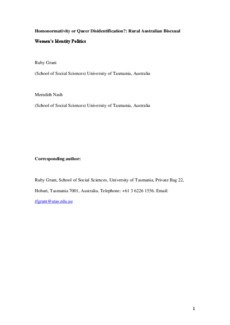 To address this knowledge gap, this article examines bisexual and queer young women’s understandings of sexual labels in Tasmania, Australia. Drawing on Jose Esteban Muñoz’s disidentifications, we argue that while neoliberalism and homonormativity do influence rural queer women’s identity politics, their lived experiences present specific challenges that draw attention to the urban-centricity of homonormativity.